Factional tensions have broken out within Reboot, the SRC campaign run jointly by Labor Left (NLS) and Labor Right (Unity), after presidential candidate and Unity member Adriana Malavisi sent a letter of support to college students. NLS, considered the more progressive of the two factions, has distanced itself from the document and Malavisi’s promise to work for a “brighter, safer future for the colleges” if elected. NLS claims it disagrees with the letter’s contents and says it was unaware of the letter until rival campaign Grassroots published it on Facebook. Reboot has backpedalled, indicating it will retract and apologise for the letter, which comes just days after Elizabeth Broderick released a report on the need for cultural renewal at scandal-plagued St Paul’s college. 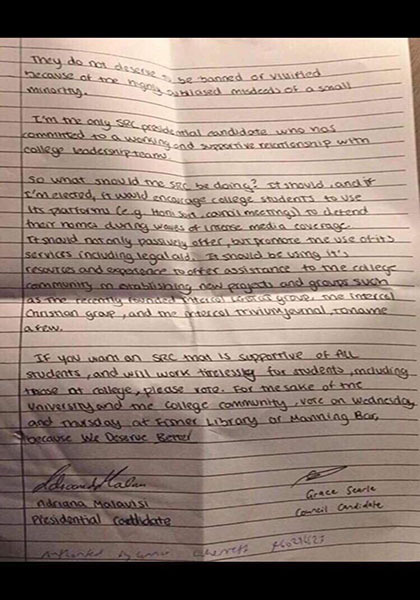 The letter is co-signed by Wesley College resident and Reboot for Colleges ticket head Grace Searle and is authorised by Unity headkicker, Reboot campaign manager and USU Board director Connor Wherrett. It was circulated on Sunday evening and written from Malavisi’s perspective. The letter begins by explaining that the current SRC administration voted against a proposed ban on protestors using the phrase “Burn the colleges”. Grassroots, a broad left coalition, currently controls the SRC, and its presidential candidate, Lara Sonnenschein, is one of Malavisi’s main rivals for office. Malavisi expresses her “disappointment” in the treatment of colleges, saying she was “disgusted” when protests were held to ban the colleges and Wesley College was “vandalised”. Instead, Malavisi advocates for an SRC that has not “forgotten […] the people who live at college are also students at USyd”, and asks college students to “vote” for the sake of “the University and the college community”. Malavisi then promises to promote SRC services, like “legal aid”, for the colleges’ use. She also proposes using the SRC’s “platforms (e.g. Honi Soit, council meetings) to defend [the colleges’] names during waves of intense media coverage.” The president has no editorial control over Honi, but does submit a weekly report and can veto the publication of legally objectionable material. 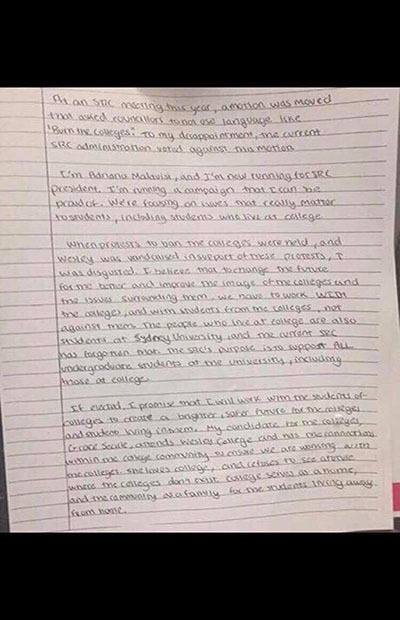 SRC Wom*n’s Officer and former Grassroots member Madeline Ward obtained a copy of the letter from an anonymous college source before uploading it to Facebook late on Sunday evening. Ward targeted NLS in the criticism attached to the post. Wherrett then confirmed to Honi that “Reboot will be making a statement, apology and retraction of this letter on our page [on Monday] morning”. Honi understands Wherrett personally contacted Ward and Syed to apologise for the letter.